He said that while most stretches witness illegal bike parking, at Shanthi Colony, even cars are parked as the footpaths are relatively wider. 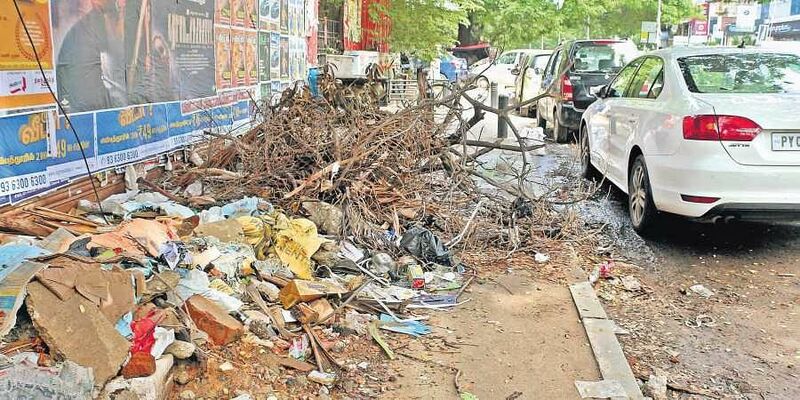 CHENNAI: Anna Nagar may be known as the ‘VIP Enclave’ but encroachment by food outlets, puncture and shoe repair units, tea stalls and illegal parking on the footpaths of this suburb do little to live up to this name. Pedestrians in the area rue that they are forced to walk on the roads as most of the footpaths have been occupied. “As Shanthi Colony is one of the arterial roads with bustling traffic, it witnesses a lot of commercial activity. Lately, a lot of eateries have come up and when we go to complain to the traffic police, they ask us to go to the Corporation and even they haven’t been very responsive on this aspect,” said P Balamani, a resident of Anna Nagar. Even the interior pockets of Anna Nagar like the 18th Main Road have been witnessing the same issue. Residents say that the Metro Rail and flyover projects in the area have diverted traffic to the interior roads and due to this, the vendors have started businesses here as well. When contacted, a Corporation official said they have been evicting the shops regularly, but the vendors keep coming back. “Also, different departments are involved in removing the different type of encroachments. For instance, the authority to remove parked vehicles lies with the traffic police, but he can’t control eateries. So, this adds to the delay,” he said.